There are many opportunities in each region to (learn to) dance and exercise. In Belgian Limburg, with 44 municipalities, there are 12 dance schools and 33 dance clubs. Without other organizations such as women's and cultural associations or groups of seniors giving dance lessons. Without district committees and parish halls who also have an offer. In every town there is somewhere a dance hall to find. 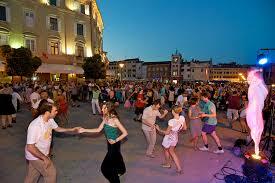 Except in dance schools and clubs are mainly Salsa and Argentine Tango often danced in halls and cafes. The music on those evenings is usually limited to only (or mainly) Salsa (and Bachata, Merengue and Zouk), respectively Argentine melodies (Tango, Milonga, Vals). You meet here also frequent the same Salseros and Tangeros whom are busy with 'their' dance, often fanatical or exclusive. Other locations as some Discotheques or cafes have a typical offer for disco- and dance music. At clubs or associations you often need a membership to gain access. Sometimes it’s sufficient to register (at the door or in advance), or a higher entrance fee for non-members will be charged. Also, some dance schools only allow students to practice on evenings. So ask best before you leave. - Available web site with good information. - The (estimated) effective duration of a lesson (excluding breaks) in minutes, the number of classes per series, the cost, and then the corresponding cost per person per hour. - Entrance fee for members and non - members, or mention 'members only'. - Cost of membership fee (per year). Sometimes membership fee for a federation is included. Sometimes insurance coverage’s will possibly differ. Inform if desired by website or through contact. - The cost of a regular soft drink. That information will give you a good idea of ​​where you end up. Personally, I like to go dancing in various dance schools. That gives a lot more variety in music, atmosphere, meetings, and dancing steps. The best is that you just try it. And still prefer a normal characteristic practice evening than on a brushed off, souped-up and much too busy open house where you see a lot of practice that on a regular night never will be seen. The launch of new series of classes is usually provided (after any open days and trial lessons) around mid-September (and mid-January). Probably you will find on the website the right data. World famous with dancers are the outdoor summer dance parties. or every Tuesday from July 8 at Kattendijkdok Antwerp if you like Argentine tango. Through the Internet and flyers in dance halls you'll find many more dance events, also in your own neighborhood.